Winter 2017 has been creeping in slowly and finally, we can all start dressing in our big cosy jumpers and knits. This is such a gorgeous time of year and an exciting time to play around with fashion trends. If you have been thinking that you need a few warmer pieces in your wardrobe look no further. Here are some gorgeous bits that would be perfect for keeping cosy on the winter days. This beautiful cosy jumper from & Other Stories ticks so many boxes. Most importantly this jumper will keep you warm and cosy but it is also really stylish. 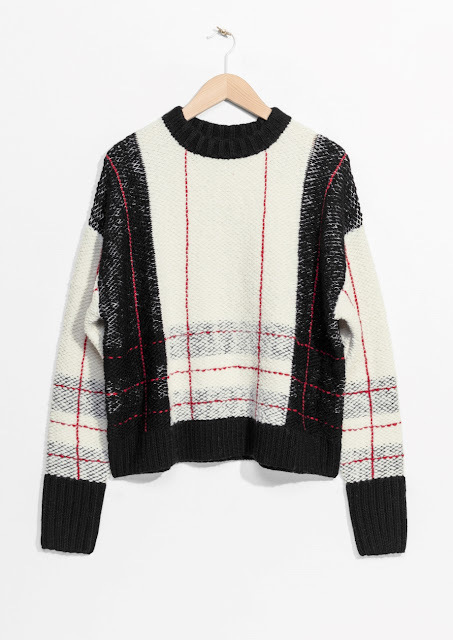 Cosy clothes don't have to mean that you look slouchy, this jumper is chic with the slight checked pattern and the different blocks of colour. This is a super buy, it would be fab with a nice skirt, tights and boots. You can shop this jumper here. Who else buys a knit every year that you just wear over and over again? While statement wardrobe pieces are always good, it can be nice to buy yourself something brand new and #treatyourself! 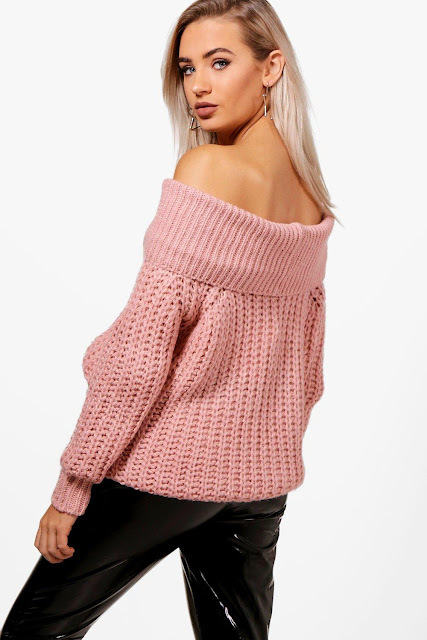 How gorgeous is this pink bardot knit jumper. You can feel cosy and slouchy but still be so on trend, and this gives you a reason to keep your fake tan topped up throughout the winter months! Shop this from boohoo here. For something to be cosy it doesn't always have to be chunky and knit. Imagine how snug it would be to be tucked up in this gorgeous check mac coat. The colour, cut and print is classy while the length, buttons and high collar make this super cosy. Shop this beauty from ASOS here. If you are a fan of oversized clothes and let's face it most of us like a cosy oversized shirt or jumper every now and then, this brown knitted drop shoulder jumper could be the perfect addition to your wardrobe. The colour is perfect for this time of year and this is a simple addition to your wardrobe that would go a long way. Shop it from Missguided here. 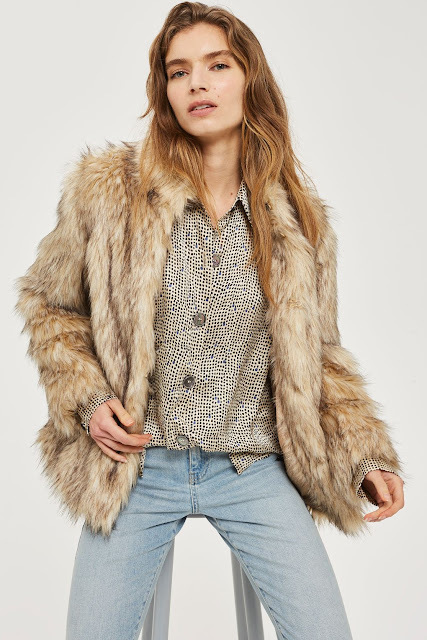 This Topshop faux fur coat is for the fashion-forward gals among us. Stand out from the crowd with this beauty. Fur is huge every single winter and this year is no different. People are becoming bolder and braver with fashion than ever before, especially when the gap between high street and designer is being bridged year on year. If you are up for rocking this beautiful coat you can shop it here. We all need a little love from a cosy cardigan now and then. 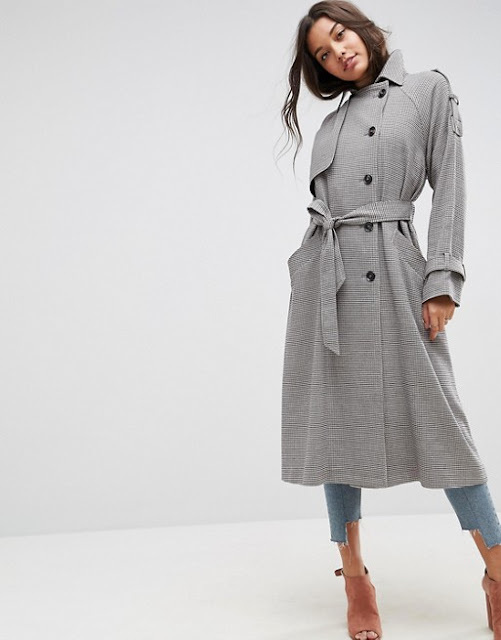 This wide rib one from Topshop has large pockets which is always a bonus and just looks great with all black underneath making getting ready easy but still cosy and stylish. Shop it here. The jumper dress is a style that some people are afraid to try but really this can become a go-to look for anyone. Bare legs might not be an ideal option but with tights and thigh high boots, this simple jumper dress can transform into a well put together outfit. Jumper dresses can often be very baggy so a belt at the waist can sinch you in. Throw on a chunky scarf and you are ready to rock. Shop this dress here (it comes in lots of colours!). Disclaimer - Some of these links are affiliate links with RewardStyle and a small amount of commission can be made through sales. You will not be charged any differently by using these links. Everyday Inspired - What's on trend right now! Occasion looks to inspire you for wedding season!